This week I'm showing my creative process using up scraps and leftovers as I go. Yesterday I showed you a card that featured the gorgeous Flourish thinlit so today I'm showing you what happened to the piece of Whisper White cardstock from which the flourish was cut. When I cut the Flourish, I was moderately careful to centre the die on the scrap of cardstock I used. I was also careful to keep all the little pieces from the die cut. My first step today was to trim the piece of white cardstock into a suitable layer for this card. I then adhered it to the Tranquil Tide layer which in turn was adhered to the Pool Party base card. I then added a few of the little pieces saved from the die cutting (I certainly don't have sufficient patience to glue on all the little pieces from the leaves!). I already had one of the little Pool Party flowers leftover from a previous card so I just cut one more and adhered them to the corners. That step was made easy by using the Multipurpose Adhesive sheet. You may be wondering which die I used - this is a sneak peek of the Petals & More Thinlits in the 2018 Occasions Catalogue. I stamped the banner and word from the Thoughtful Banners stamp set and cut it out with the coordinating Duet Banner Punch. I also punched a piece of Pool Party cardstock and added it to the back of the banner. 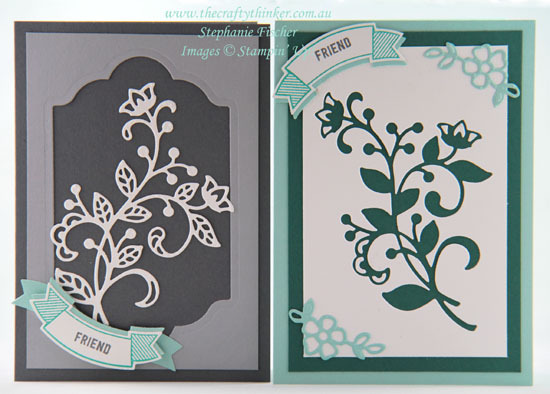 Here are the two Flourish cards together. Next time (on Wednesday) I'll show you the Christmas Card I made with the Smoky slate label. Waste not, want not! 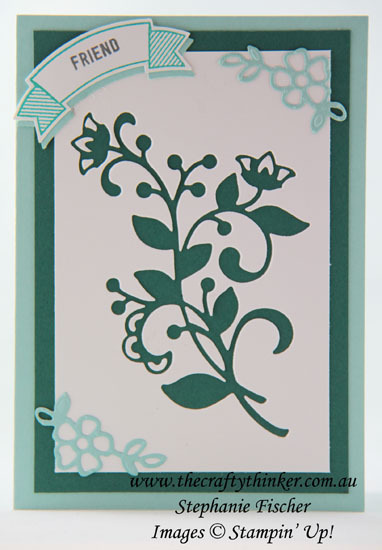 Use the negative shape left over from die-cutting the flourish in another card!